INFORMATION File Under Group No. Carter dual 4-barrel carburetors are now available as a factory option A8 on Wildcat and Riviera Gran Sport. A Rochester Quadrajet carburetor option A9 is available on Skylark Gran Sports. These options are available only on automatic transmission equipped cars. To provide extra performance, these options include a special distributor (initial timing 12°BTC.) and a high speed camshaft (same as the 1965-425 engine). The 1966 Carter Model AFB dual 4-barrel carburetors are the same as the 1965 option except for choke calibration changes. These changes result in new part numbers for both front and rear carburetors. All carburetor adjustments are identical, however. Each carburetor has a primary section (consisting of the 2-barrelled forward half) and a secondary section (consisting of the 2-barrelled rearward half). Although fuel for idling is supplied by the primary section of both carburetors, fuel for all other operations except for hard acceleration or extreme high speeds is provided by the primary section of the rear carburetor only. Only the rear carburetor is equipped with an automatic choke and a clean air system for the choke. The rear carburetor also provides connections for the positive crankcase ventilator and the distributor vacuum advance unit. The front carburetor (primary section) has fixed idle orifices. 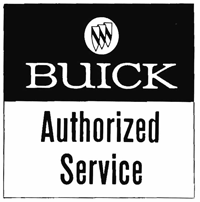 Only the rear carburetor (primary section) has idle mixture adjusting needles and an idle speed adjustment. This speed adjustment is of the idle by-pass type; all throttle valves are closed tight, so all air flow at idle is metered by a single brass air adjustment screw in a by-pass channel. Operation of the dual carburetor system from idle to wide open is as follows: As the accelerator pedal is gradually depressed, the primary of the rear carburetor starts to open. When it is approximately half open, the primary of the front carburetor starts to open. Next the secondary of the rear carburetor starts to open, and last, the secondary of the front carburetor starts to open. Each of the four sections opens at such a rate that all throttle valves reach the wide open position at the same time. With choke open, move rear carburetor throttle lever to closed position, making sure that throttle valves close tightly. Move rear carburetor throttle lever to wide open position, making sure that nothing prevents lever from actually contacting wide open stop on carburetor casting. See illustration. With both carburetors held at closed throttle, adjust turnbuckle until it just contacts trunnion at front carburetor, then back-off turnbuckle one turn for proper clearance and tighten lock nut. With rear throttle rod held fully rearward, adjust front bolt until throttle levers of both carburetors contact their wide open stops at the same time. Remove air cleaner and gaskets. Start engine and run it at fast idle until upper radiator inlet is hot and choke valve is wide open. On automatic transmission cars, place a safety block in front of either front wheel and apply parking brake firmly, then shift transmission into drive. Accelerate engine with left foot ready over brake pedal; if car does not move, it is safe to proceed with adjustment. Make sure that all throttle valves close fully, then set idle speed at 550 RPM (with A/C off) by turning brass air adjustment screw in rear carburetor. NOTE: If idle speed cannot be adjusted fast enough, make sure engine is properly timed at 12°BTC. Check positive crankcase ventilator system for proper functioning by squeezing off ventilator hose to stop all air flow. If idle speed does not drop 60 RPM or more, PCV system must be corrected before proceeding. Check idle stator switch for proper functioning by disconnecting switch connector. If idle speed does not drop, correct idle stator system before proceeding. Make sure hot idle compensator valves are closed by pressing on each valve with a finger. If idle speed drops, correct idle compensator before proceeding. Adjust idle mixture needles in rear carburetor to obtain highest tachometer reading. Then slowly turn needles in (leaner) one at a time until tachometer reading drops 20 RPM. Note direction of needle slot, then turn needle out (richer) exactly 1/4 turn. If tachometer reading has not returned to maximum, carefully turn needle out 1/8 turn at a time until maximum reading is just regained. If idle speed is now too fast, turn idle a.ir adjustment in to decrease speed to 550 RPM. Since this is strictly an air adjustment, this throws off the idle mixture. For this reason, always adjust idle mixture needles last. Stop engine. Check dash pot adjustment by opening throttle and allowing it to snap closed. Time dash pot delaying action from the point where the throttle lever first hits the dash pot to the point where the lever stops moving. Adjust dash pot as required to delay or cushion closing action two seconds. Tighten lock nut securely. The 1966 Rochester Model 4MC Quadrajet carburetor for use on Skylark Gran Sports is the same as the carburetor used on 1966-425 engines except for choke calibration changes. These changes result in a new part number for the Skylark Gran Sport carburetor. All carburetor adjustments are identical, however.